London based INQ manufactures mobile devices focused more on social media connectivity. They currently have three mobile phones, INQ Chat 3G, INQ mini 3G and INQ¹. 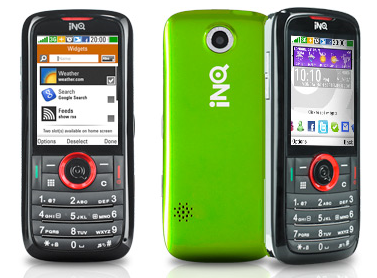 The INQ¹ is worlds first dedicated social phone, and is the winner of global mobile awards 2009. All INQ phones come with Twitter, Facebook, Orkut, chat and email integration. 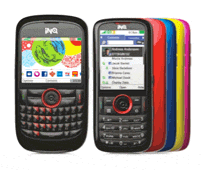 INQ Chat 3G has a QWERTY keypad and 3MP camera. The INQ mini 3G comes candybar form factor and a 2MP camera. Both have very colorful UI design and external appearance that would attract young students and professionals. Moreover, the price is very affordable for this configuration. So if you are a social media addict from India, there is one more reason to celebrate. INQ and Aircel launched INQ chat 3G and Mini 3G phones in India. They have announced special introductory offers for both phones with free internet plans. INQ Chat 3G comes with QWERTY keypad. So here its comfortable to type emails, messages and update status messages on Twitter, Orkut, Facebook social profiles. 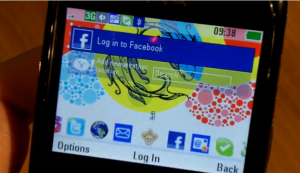 The home screen of the device can be customized with widgets and applications. INQ Chat 3G has a slide switcher at the bottom of the screen for movement through different applications. The switcher can be controlled by a dedicated key on the right side or using the joystick. Images taken with the 3Mp camera can be uploaded directly to email and social networking sites. Contact application of the phone lists updates from social profiles of corresponding friends and relatives. There is also an inbuilt GPS receiver to support Map application and for location updates. INQ Chat 3G and mini 3G are based on Brew OS 4.0 with application support for Java platform. The interface of INQ mini 3G is somewhat similar to INQ chat 3G. However, mini 3G doesn’t have QWERTY keypad and thereby its smaller in size. Furthermore, camera is downgraded from 3MP to 2MP. Therefore, the price of INQ mini is comparatively lower than Chat 3G. INQ Chat 3G and INQ mini 3G comes with replaceable background covers in 7 different colors, like in Samsung Corby. As the name indicates, both are high speed 3G devices that can be even connected to desktops as a modem. Newer versions of applications used in the phone can be updated over the air when they are available. INQ Chat and mini 3G package includes software with the means to sync videos, photos and music from Windows or Mac media players. 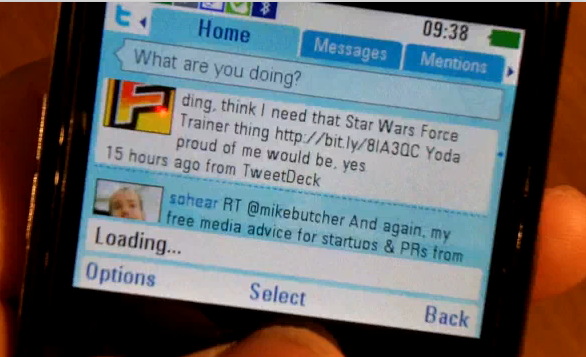 Chat 3G can push updates from Twitter, Facebook, Orkut and other social media sites. Chat with Windows messenger, Skype and others. Send and receive email using Hotmail, Gmail, and Yahoo applications. 2.4 inch QVGA TFT screen, 3.2MP camera with autofocus, GPS, 3G modem, QWERTY keypad, switcher for moving through applications, 120 MB memory (up to 8GB), Brew OS, video and audio player. INQ mini 3G includes almost all applications available with Chat 3G. No QWERTY keypad, 2.1 inch QVGA TFT screen, 2 MP camera, no GPS receiver, 100 MB memory( up to 8GB expandable), Brew OS, support for Java applications. INQ Chat 3G and INQ mini 3G are exclusively available through Aircel stores in India. Aircel users on INQ plan can recharge with Rs.251 to get 3 months internet browsing (2GB pm) and 150 free Aircel-to-Aircel calls. Is it necessary to have only Aircel connection on INQ? I have been using Airtel’s GSM connection from much time and don’t want to change it at any cost. 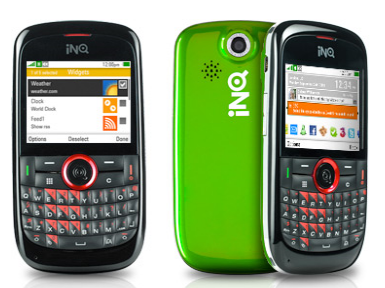 INQ Chat 3G and INQ mini 3G can be used with other SIM cards. But the special offer price and plans are available only with Aircel. @Babai Yes as the name says, INQ chat 3G and INQ mini comes with high speed 3G connectivity. You can use it as a modem to connect your PC to internet. ya mobiclub, I knows very well about 3G, I wana know whether Aircel is giving 3G Service or not, as per my knolodge aircel have very poor GPRS Speed compair to Airtel Network. BSNL is the only company with 3G and wireless mobile broadband service in India. However, many companies are expected to participate in 3G auction to be held on April 9. Still we are not sure about Aircel’s participation in 3G auction. For now they have unlimited GPRS plans at 98 RS valid for 30 days. hay Mobiclub Team; thanks for the quick update! Thanks, I likes ur style of reply, I will realy wana subscribe this blog! If I buy a INQ chat 3G With Aircel… can I change the connection after after sometimes with some other network connection ? @suvankar: Of course you can! In contrary, who on Earth will tend to stick to Aircel Network. Aircel network is crap! Even at the ground floor of our building, network sticks sink to zero!! Don’t expect something good about 3G service in India yet. Till now only BSNL is equipped with 3G; but their connectivity is again even worse than that of Aircel. The auction Mobiclue is talking about will certainly turn out a joke as main tycoons like Airtel, Vodafone, Tata, Reliance have not yet demanded for 3g spectrum, they are still trying to flourish their network strength on 2g. But, yeah! Dont’ worry Aircel is said to be in 3g race in this auction. Hey mobiclue..does the inq chat 3g support wifi?? and what about features like Camera flash, mp4, bluetooth and radio?? and Will the brew platform support java apps?? also do You think this phones worth It or is It just an experiment?? are the battery covers included in sales package of inq chat 3g? if not then, is the black one available? i’m not willing to buy the red one. Only BSNL is having 3G, which is super fast; How come this phone was tested in Aircel?? There is something fishy. Only BSNL can provide fastest 3G, HSDPA and LTE; Nobody can beat BSNL in data speeds. See what happened in Landline Broadband. M rely interstd in aircel’s INQ 3G CHAT…But wil it hv the said intrnt speed as advrtsd wit aircel conction? Has anyone used the INQ Chat 3G with Aircel connection? Does it support Skype to make free phone calls? Can GPS be used without extra charges? Does it support third party applications for download like Fring and Nimbuzz? What is the speed that you receive on Aircel GPRS? I bought an unlocked INQ 3G Chat yesterday, but the GPRS settings on vodafone is not available. Please do let me know you have any. can INQ chat 3g works good with Sim other than Aircel……….???????? Does it works same with other Sim ????????? Im new to this group, request someone to suggest whether buying Aircel Chat 3G is money worth ? If yes how so ? Hi what GPRS speed can we expect in INQ with aircel connection? Telecom service operator Aircel is planing to launch its 3G services across India in 13 circles. They have license of 3G spectrum got 13 out of the 22 circles all over India this year. Other operators like Tata Docomo become the first private operator to provide 3G services in India over 9 circles on this Diwali. Later Barati Airtel also launched at the end of 2010. Aircel has got 13 circles including Delhi (Metro), Mumbai (Metro), Andhra Pradesh, Gujarat, Haryana, Karnataka, Kerala, Madhya Pradesh , Maharashtra & Goa, Rajasthan , Punjab, UP (West) and UP (East) in the 3G auction held this year. Is INQ mini 3G is Dual Facilated one ? when will start the 3G service in kerala? In inq mini 3g. . .we can use bsnl 3g service. . ? ? ?